Rumors in Germany are persistent about Thomas Muller being one of the players that are currently unsettled in the Pep Guardiola vision of Bayern Munich, which generates plenty of interest in the Premier League. After already pointing out Manchester United being a potential landing place for the German international, it seems like Liverpool and Arsenal would also love to see him join their squads. But while Germany’s most popular media outlets are persistent that Muller might be on his way out of the club, the team’s president Franz Beckenbauer has mentioned more than once that Bayern should do everything they can to keep him at the club he’s been a part of since 2000, when he joined as an 11-year old boy. The 24-year old has been a first team player since 2009, winning two Bundesliga titles and one Champions League trophy, reaching two finals as well. 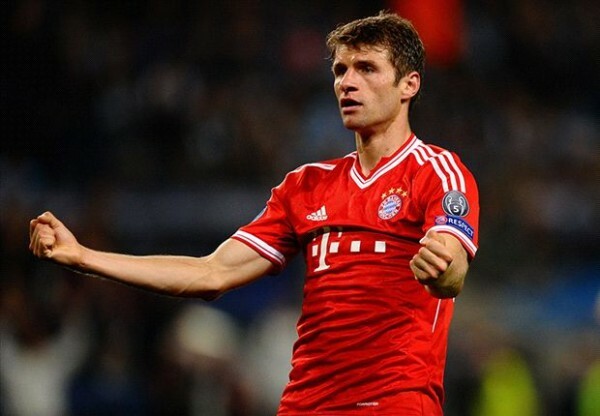 Muller is not one of those players who needs to fit a certain role. He’s probably at his best when playing at the right side of the attack, as a blend of a supporting striker and right winger, but he does very well behind the striker, on the left side or even as the target man if necessary. He has 13 league goals this season for Bayern and 25 in all competitions, adding 15 assists. His value is estimated at around £40 million at the moment, with his contract running out only in 2017. While you might imagine Manchester United and Arsenal spending that kind of money on one player (Arsenal did that with Mesut Ozil to arguable success), Liverpool who need a little bit more quality at pretty much every area of the pitch are less likely to go on such a spending spree, or at least spend that kind of amount on just one player, as good as he might be. Players don’t leave Bayern so quickly, despite the rumors from Kicker and Bild. It’s hard to find a bigger club in the world right now in terms of financial power and set up for long term success locally and in the European competitions. Maybe there’s more international allure to a big-name in the Premier League, but Bayern Munich, with or without Pep Guardiola in control, are simply a better team right now and probably next season as well.